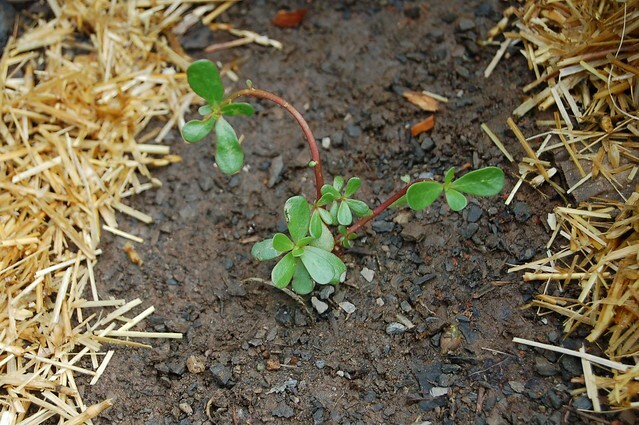 If you garden at all, you're probably familiar with purslane since it's a pretty common weed. But that's just one way of looking at it. It does tend to grow all over but it's also downright tasty and ridonkulously good for you. A succulent, low-growing plant, purslane has a mild lemony flavor with a hint of pepper and a pleasing texture that is half-chewy, half-crunchy. I like it so much that I actually planted it between the rows of my garden this summer. Known as verdolaga in Spanish, semizotu in Turkish and pourpier potager in French, purslane is packed with vitamins, minerals, and antioxidants and has the highest Omega-3 content of any leafy green. It's so full of goodness that Michael Pollan actually called it one of the two most nutritious foods on earth in his treatise, In Defense of Food: An Eater's Manifesto . 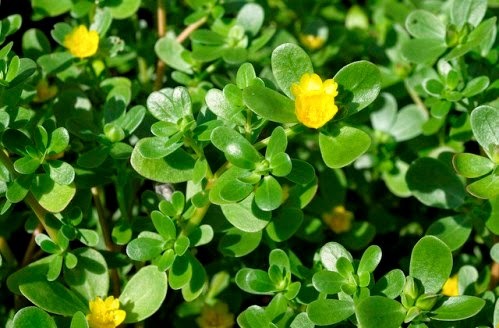 Says Pollan, "Wild greens like purslane have substantially higher levels of Omega-3s than most domesticated plants." His other top pick is lamb's quarters, also considered a weed. Best of all, it has a lovely taste and texture. I like to eat it in salads. 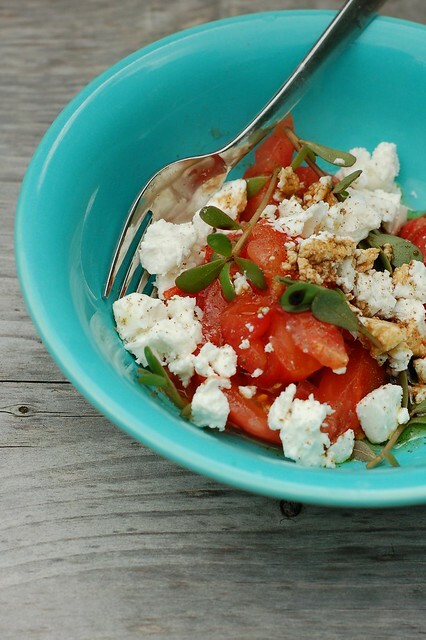 Or if you feel like something even simpler, just slice up a ripe tomato, add some purslane and a little crumbled goat or feta cheese, drizzle with good olive oil and vinegar and add salt and pepper to taste. The sweet juicy tomato pairs so nicely with the crunchy, lemony purslane and the cheese adds a rich, creamy element that makes it even more addictive. MWAH - so good! 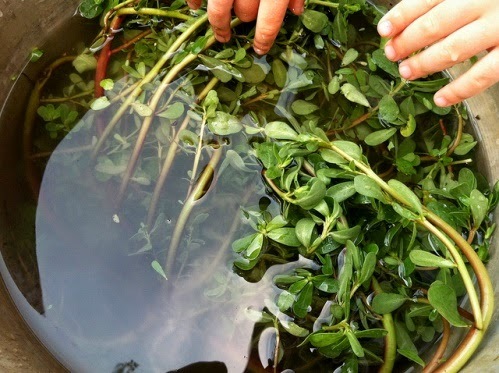 Purslane is very versatile - you can eat it pickled, in a chopped Middle Eastern salad, in a green salad, in tacos, with garlic, yogurt and salt, in potato salad, in a cucumber-yogurt salad, in a hearty lamb stew, in soup, and more. To sum up, purslane is a wildly nutritious, tasty vegetable that grows like a weed. What's not to like? One of my favorite dishes when I lived on the Island of Crete was Purslane boiled in olive oil and potatoes, finished off with lemon juice and minced garlic. Thank you for the great article and recipes! 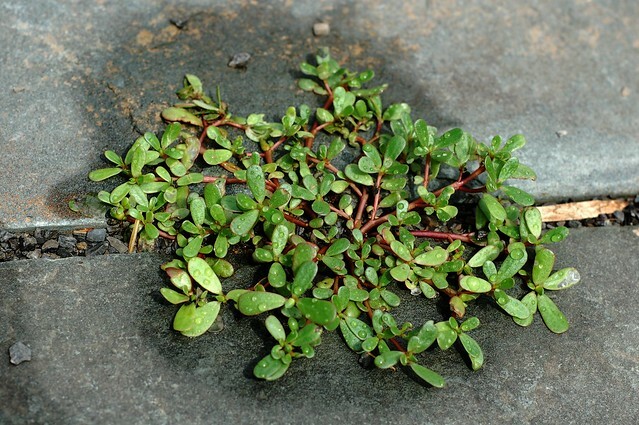 Purslane was one of my favorite foods when I lived on the Island of Crete. Not only do the inhabitants of the Island eat it, but the chickens do too. This is why chickens and eggs there are so high in Omega-3 fats. Thanks, Bill! And thanks for making that connection about the chickens/eggs/Omega 3s. I had totally overlooked that even though I had heard that chickens love purslane and I read The Queen of Fats a number of years ago. Awesome point!